Properties in Georgetown Historical Society average 4.8 out of 5 stars. Property 3: Enchanting Five Islands - Home of the biggest lobsters and deep water for boats! Property 4: Loony Bin Cottage - A stones throw to the water's edge. Property 5: Your own private island! Rustic and close to Nature. Enjoy this little cottage in the woods built by Grandy and Grandma! Property 6: Enjoy this little cottage in the woods built by Grandy and Grandma! 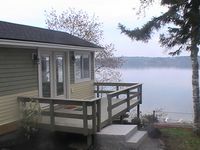 Property 9: Westport Island Cabin on the river with private dock. Drive, boat or fly in. Property 14: Private waterfront home w/ large deck and deep water dock! Property 16: Bayfront cabin w/ incredible views & shared dock - ideal for hunting/fishing! Property 34: Welcome to "Captain's Catch"! Quaint, quiet and affordable cottage awaits! 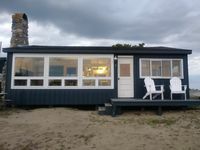 Property 38: 3 bedroom cottage only 187 steps away from Popham Beach! Property 45: Driftwood Cottage - Renovated Oceanfront with Stunning Views in East Boothbay! Cheerful Southport Island Waterfront Cottage, "An Tigin"
Property 48: Cheerful Southport Island Waterfront Cottage, "An Tigin"
What an amazing place to stay! The time of year we went was considered off season for a lot of places that do not open until Memorial Day but we still found plenty to do. The beach was not busy.....we were the only one staying in the cottages and it was so incredibly peaceful. Just what we were looking for. The price could not be beat for such an amazing place to stay. I thought we might get cold at night as it was still pretty chilly this time of year. The heater kept the place just right and a fire added even more warmth. Deborah was great and very responsive with emails on things to do, places to eat and all the information we needed. Definitely an awesome and amazing place to stay!! A must go! Two of us stayed at this lovely one room cottage during our visit to Bowdoin. Although it is a very small space indeed, the kitchen and bathroom are modern and spacious and even the blow up mattress in the pull out couch was surprisingly more comfortable than expected. This place is all about the views, which are breathtaking. There is some construction work next door, but none was happening during our weekend stay, so it was very quiet. We had our morning coffee on the deck and enjoyed listening to the waves crashing at our feet. Wonderful!